Vumilia Nyararukundo was born in the Democratic Republic of Congo in 1963, but fled to a Refugee camp in Uganda in the 1990s. She has six children including one adult daughter who still lives in Uganda. Her three teenage kids live with her here. Vumilia works full time folding uniforms at Aramark Uniform Services. She was excited to be able to buy a car last year, but she has not learned how to drive it yet. She looks forward to learning to drive and to owning her own home in the future. When asked what is most different about the US from Africa, Vumilia answered, “I sleep better here. There is no fighting. I am safe.” She went on to say that people have been very nice to her here in Wichita. Although she likes living here, she is not fond of American food. She’s happy that she is able to buy chicken and fish and vegetables to prepare African food here. She spends most of her free time fellowshipping with her family and with her Oaks church family. She was very happy last year when her two adult sons and their families both moved to Wichita. Now she is able to see 10 of her 13 grandchildren regularly. Her newest grandchild, Promise, was just born in February. 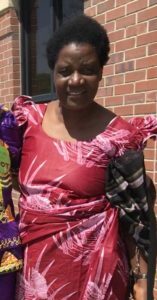 Vumilia is a strong prayer warrior for her church and family. Prayer is very important to her because she knows that “Jesus is everything.” She was the first woman elder at the Oaks church and also counts the offering every week. You may see Vumilia on Sundays sitting in Eastminster Fellowship Hall before the 9:30 classes. Be sure to go say “hi” to her. She has been practicing her English with Kay Jones every Saturday for the last 2 years and would love the opportunity to try it out on you!